In the first posting we introduced the new .NET (2.0+) Trace framework and talked about the features that make it a comprehensive Tracing tool. We then went on to look at more advanced usage and configuration in the second posting, particularly around the XmlWriterTraceListener and the Microsoft Service Trace Viewer. The third posting looked at Activity Tracing, Activity Propagation and WCF Activity Tracing. The fourth posting looked at how to propagate Trace information to HTTP based endpoints such as ASP.NET and ASP.NET MVC. You will start to see you code can become quite complex as you add Activity tracing information; this is due to having to close off any Start or Transfer Activity. To ensure you close off any Starts or Transfers, you need to make sure you catch any errors and in the finally section of the code call the appropriate Stop or Transfer back. The TraceLogicalScope class provides a simple and safe way to encapsulate a Start and Stop activity. The TraceTransferScope class provides a simple and safe way to encapsulate a Transfer to and from an activity. Hopefully these classes should prove invaluable if you are instrumenting your code with Trace and Activity information. In the first posting we introduced the new .NET (2.0+) Trace framework and talked about the features that make it a comprehensive Tracing tool. We then went on to look at more advanced usage and configuration in the second posting, particularly around the XmlWriterTraceListener and the Microsoft Service Trace Viewer. The third posting looked at Activity Tracing, Activity Propagation and WCF Activity Tracing. This fourth posting looks at how we can propagate Activity information to ASP.NET / ASP.NET MVC end points to again create end-to-end Trace results for complete diagnosis of an application. Unlike WCF, there is currently no way to automatically propagate an ActivityId to an ASP.NET based end point. So, the first thing we need to do is figure out how this will work. The usual way to pass supplementary information or parameters to an end point as part of a HTTP request/response, is through a HTTP header. A HTTP header is a simple name-value pair that isn’t required to actually make the call but can be read by the client or server if it is present. We can use a HTTP header to pass our ActivityId to an ASP.NET based, or any other end point for propagation purposes. Currently, there is no defined, standard HTTP header for identifying an ActivityId; this means we will need to define something ourselves. Additionally, outside of the .NET Trace framework which uses ActivityIds, end-to-end Tracing usually uses a “Correlation ID“ for correlating information between systems. In the example code below we are going to use a “Correlation-ID” HTTP header to pass the Trace ActivityId to our end points (this can of course be anything you want). Adding a header to an HTTP call in .NET is trivial, as is adding the ActivityId. The following code can be used to achieve this. It is possible to use a tool like Fiddler to see the newly added HTTP header. The following shows an example of a call to a local ASP.NET end point using the code above. Ideally, we want our ActivityId to be associated with the Trace framework before we get to our ASP.NET/MVC code; this would mean we just instrument our code with no regard for being in a different process and the Trace output can be followed end-to-end. This is easily achieved through the HTTP Pipeline and IHttpModule framework. Firstly, remember how we discussed that the namespace of the code should be used for the name of the TraceSource so that other developers know how to configure the listeners for any code well, in the case above, the AssemblyNameHere needs to be changed to your namespace. Secondly, as this is generic code, it has been written to support any Correlation-ID name for the HTTP Header and this can be changed from the default “Correlation-ID” using a web.config appSetting called “TraceModuleCorrelationHeader”. Thirdly, if no ActivityId is received at the HttpModule, one is created and applied to the Trace.CorrelationManager.ActivityId. The reason for this is that all of the subsequent code will be related to this starting point rather than having all activity grouped under an empty Guid. Configuring the Trace framework works in exactly the same way as in the previous posts. The following shows the KEY areas of the configuration file for working with the Tracing framework and the HttpModule. NOTE: additional configuration not related to Tracing has been removed, things like pages, namespaces, debug options etc. The following shows a typical configuration including the HttpModule section. NOTE: You need to swap the AssemblyNameHere placeholders for the name of your assembly. Again, we have looked at the Microsoft Service Trace Viewer in previous posts so please check back for an introduction. One of the really powerful features of the Microsoft Service Trace Vieweris that you can open multiple files and combine the results – this is the basis of the end-to-end tracing. When we call an ASP.NET/MVC end point, we typically do so from a client different process. The Client process runs in one process space and can write Trace information to its own XML file through the XmlWriterTraceListener. Using the configuration above, an ASP.NET/MVC end point running in a w3wp process can also dump to its own XML file through the XmlWriterTraceListener. If we have passed the ActivityId correctly, the different files will contain the same ActivityIds and can therefore be combined to show the Trace Activity flow. Using the Microsoft Service Trace Viewer, we can open both the client and the ASP.NET/MVC XML files and see the comdined results. The following screen shows the complete end-to-end Activity Trace output and you can clearly see the w3wp Process Name being used for the Request/Response logging. In this posting you should have seen how to pass Activity tracing information to any end point through HTTP headers, and also how to configure an ASP.NET/MVC application to check for and wire-up received ActivityIds. One final posting will follow this with a couple of utility classes that can be used for Trace Scopes. In the first posting we introduced the new .NET (2.0+) Trace framework and talked about the features that make it a comprehensive Tracing tool. We then went on to look at more advanced usage and configuration in the second posting, particularly around the XmlWriterTraceListener and the Microsoft Service Trace Viewer. This posting builds on the previous ones and starts to look at how to instrument some code so that the logical flow can be followed, how to propagate information across process and machine boundaries for end-to-end processing, how this can be automatically supported in WCF and how we can view end-to-end trace information using the XmlWriterTraceListener and the Microsoft Service Trace Viewer. We have already seen how the TraceEventType enumeration provides us with severity levels for trace events, and how we can control the events that are recorded by the Trace Listeners through Trace Switches and Filters. The TraceEventType also contains Activity event types for Activity and end-to-end Tracing. If we run this code four times, and the third call fails due to an error, we would see the following in the Microsoft Service Trace Viewer. As you can see, this provides a comprehensive view of the logic in the code. In the above screenshot, each time the Create Customer code is called, a new Activity is added in the viewer. All of the events that are recorded under this activity are then seen on the right of the screen, grouped under this Activity. You can clearly see the logical areas of the code starting and stopping. During the execution of the third Activity, one of the events was an error so the Activity is shown in red. So, each individual Activity uses a single ActivityId which is assigned to the Trace.CorrelationManager.ActivityId. 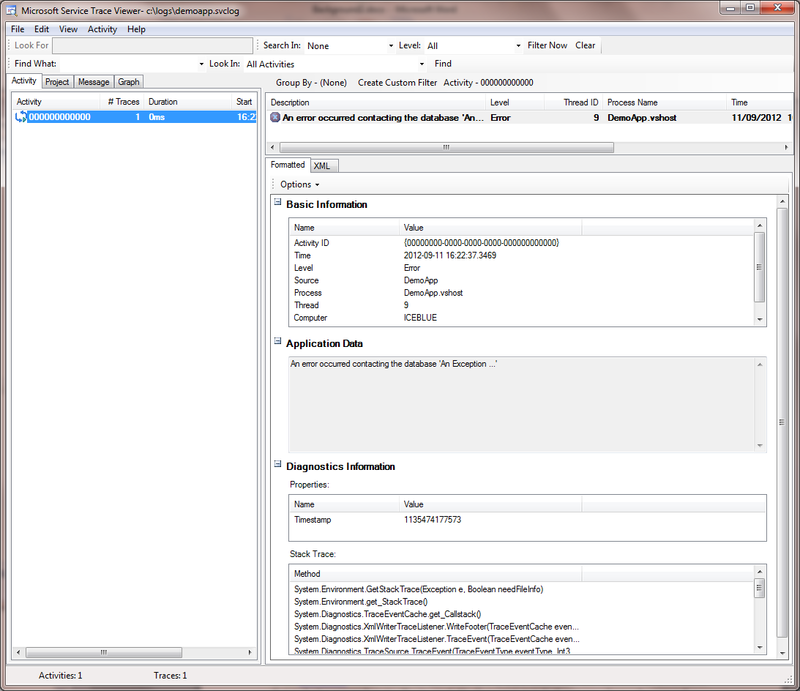 As events are recorded, this ActivityId is added to the Trace output and the Microsoft Service Trace Viewer uses this to group information when it is displayed. Changing this Guid effectively starts a new Activity, as discussed above. 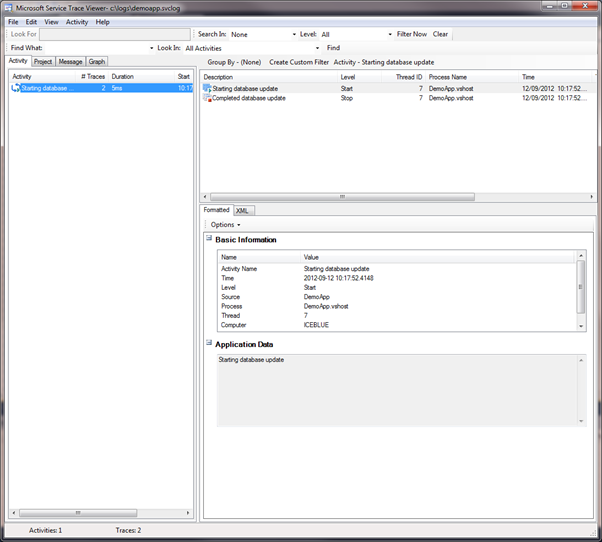 It is also possible to assign an existing Guid to the Trace.CorrelationManager.ActivityId. This means if we are able to pass an ActivityId from one process or machine to another, and re-assign it to the Trace.CorrelationManager.ActivityId before we begin to Trace again, then all of our end-to-end processing will appear under the same ActivityId in the Microsoft Service Trace Viewer. It’s that simple! WCF supports Activity Propagation out of the box, through configuration. We have previously stated that the TraceSource name that should used when writing Trace information should be the name of the assembly the code resides within. We have previously used “DemoApp” but in the case of the WCF framework, the “System.ServiceModel” TraceSource is used for Tracing information. Following this approach means we can simply configure our application to Trace output from the WCF framework itself. The following shows how this is achieved, with anything at an Information level or above and ActivityTracing events being recorded. Another feature of the Tracing framework for Activity tracing is to be able to transfer processing from one Activity to another. 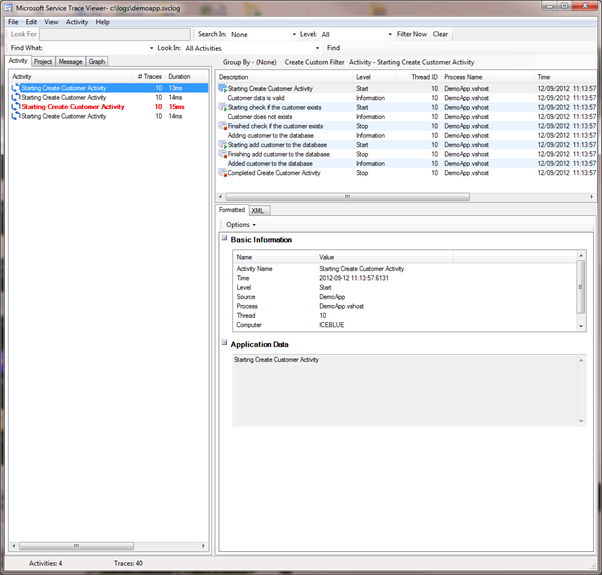 In this scenario, each individual Activity is displayed in the left of the Microsoft Service Trace Viewer UI, but a connection is also added between the individual Activities where the transfer takes place. Having the Transfer recorded means that the initial Activity can also display the Activity that was transferred to as part of its graph. As you can see below, there are two separate Activities generated by this code. The first activity is the “Debit the account” Activity only. You should be able to see the events Transfer to the “Email the user” event but this is not part of the “Debit the account” Activities event listing. The second screen shows the “Email the user” activity as a separate Activity. You should be able to see where the events start from a Transfer and at the end they return back to the “Debit the account” Activity. Finally, the following screen shows the graph view of the “Debit the account” Activity. As you can see, the graph shows all of the calls that formed part of this Activity, including the Transfer to the “Email the user” Activity. Despite there being two discrete Activities, they are related through the Transfer and can be viewed as one. In this posting, we have looked at how we can instrument our code to trace Activities through logical areas of applications and across process and machine boundaries, meaning end-to-end Traceability and diagnosis. We have seen how this can be achieved automatically in WCF through configuration. We have also seen how the XmlWriterTraceListener and Microsoft Service Trace Viewer can be used to view the log traces and combine Activities to give a graphical view of an Activity. In the next posting we will look at how we can propagate ActivityId information to ASP.NET/MVC applications for end-to-end tracing in Web Applications and Web APIs. In the previous posting we introduced the new .NET (2.0+) Trace framework and talked about the features that make it a comprehensive Tracing tool. This posting builds on that information to look at more advanced usage and configuration. You should read the previous posting before embarking on this one. The code used to Trace is very simple: TraceEvent Traces the information you pass to it; TraceData simply calls ToString on the objects that are passed to it and then calls TraceEvent. It really is that simple! There are, however, more advanced options for enhancing the Trace output through configuration. Callstack – Write the call stack, which is represented by the return value of the Environment.StackTrace property. DateTime – Write the date and time. LogicalOperationStack – Write the logical operation stack, which is represented by the return value of the CorrelationManager.LogicalOperationStack property. ProcessId – Write the process identity, which is represented by the return value of the Process.Id property. ThreadId – Write the thread identity, which is represented by the return value of the Thread.ManagedThreadId property for the current thread. Timestamp – Write the timestamp, which is represented by the return value of the GetTimeStamp() method. There are also several additional Listeners that can be configured to run in the Trace framework. In the previous posting we looked at two Trace Listeners that record information in the Console and Event Log. We discussed how these Listeners can be run concurrently so that the same Trace can be output to multiple Listeners simultaneously. We looked at how we can control which Listeners record information for different severity levels. Once the code has been instrumented with Trace calls, we have complete control over where the Trace events are recorded through configuring the Listeners. A TextWriterTraceListener redirects output to an instance of the TextWriter class or to anything that is a Stream class. It can also write to the console or to a file, because these are Stream classes. A FileLogTraceListener provides a simple listener that directs logging output to file. 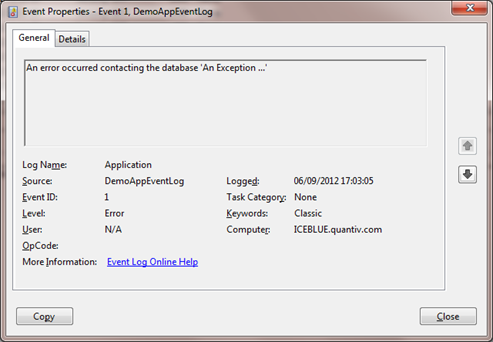 An EventLogTraceListener redirects output to an event log. An EventProviderTraceListener redirects output to the Event Tracing for Windows (ETW) framework. Click for more information on ETW Tracing. A DefaultTraceListener emits Write and WriteLine messages to the OutputDebugString and to the Debugger.Log method. In Visual Studio, this causes the debugging messages to appear in the Output window. Fail and failed Assert messages also emit to the OutputDebugString Windows API and the Debugger.Log method, and also cause a message box to be displayed. This behavior is the default behavior for Debug and Trace messages, because DefaultTraceListener is automatically included in every Listeners collection and is the only listener automatically included. A ConsoleTraceListener directs tracing or debugging output to either the standard output or the standard error stream. A DelimitedListTraceListener directs tracing or debugging output to a text writer, such as a stream writer, or to a stream, such as a file stream. The trace output is in a delimited text format that uses the delimiter specified by the Delimiter property. The IisTraceListener routes all tracing and debugging output to the IIS 7.0 infrastructure. 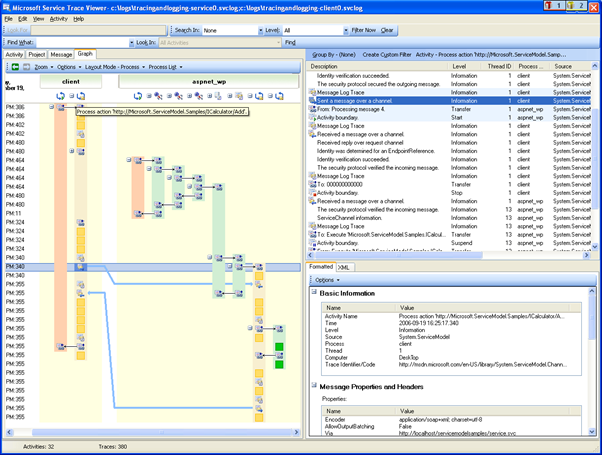 A WebPageTraceListener directs Trace messages to ASP.NET Web page outputs. An XmlWriterTraceListener directs tracing or debugging output as XML-encoded data to a TextWriter or to a Stream, such as a FileStream. The Listeners for the Trace framework are pluggable so you can also write your own. This is out of the scope of this posting but in essence you need to create a new class that derives from TraceListener and use the configuration to include this new Listener. The XmlWriterTraceListener is perhaps one of the most powerful out-of-the-box Trace Listeners available in the .NET Framework. It writes Trace events into a configurable file in an XML format but more importantly there is a supporting client application called the Microsoft Service Trace Viewer which was actually introduced with WCF. If we open the previous XML output from the C:\logs\DemoApp.svclog file generated above, in the Service Trace Viewer, we see the following detailed breakdown. Our Error message is highlighted in red and the details of the event are decomposed into discrete sections in the UI. In this posting we have looked at some of the advanced configuration techniques and Trace Listeners provided by the .NET Trace framework and the different TraceListeners provided out-of-the-box. We have also looked at how we can use the XmlWriterTraceListener and the Microsoft Service Trace Viewer to view detailed Trace events. This, and the next few postings, cover the .NET Framework’s Trace capabilities and explain why you don’t need any third party tools to understand what your code is doing. In particular this posting discusses the Trace framework fundamentals, its features and how to get started. Microsoft introduced a tracing/diagnostics framework into the first version of .NET through System.Diagnostics.Trace. The Trace framework allowed you to write messages or data to a series of Listeners; Listeners were provided in the .NET Framework and could also be constructed to write to the Event Log, databases, email, files, etc. This initial Trace framework was pretty light and, as many people adopting .NET were coming from a Java background, this framework wasn’t really deemed powerful enough compared to several of the existing Java frameworks. Several new external frameworks started to appear, Java based frameworks such a log4net and nlog, and the .NET based Enterprise Library Logging Application Block. These frameworks were all very powerful and also tended to be quite complicated to use. For reference, developers become very passionate about logging and their chosen framework, and as people move around jobs and even departments within the same company, hostility can be encountered! Structurally, the initial version of the Trace framework was pretty sound. In code you could Trace some information. The Trace framework received this information and ran it through a series of configurable Listeners with each one being given the information to record. 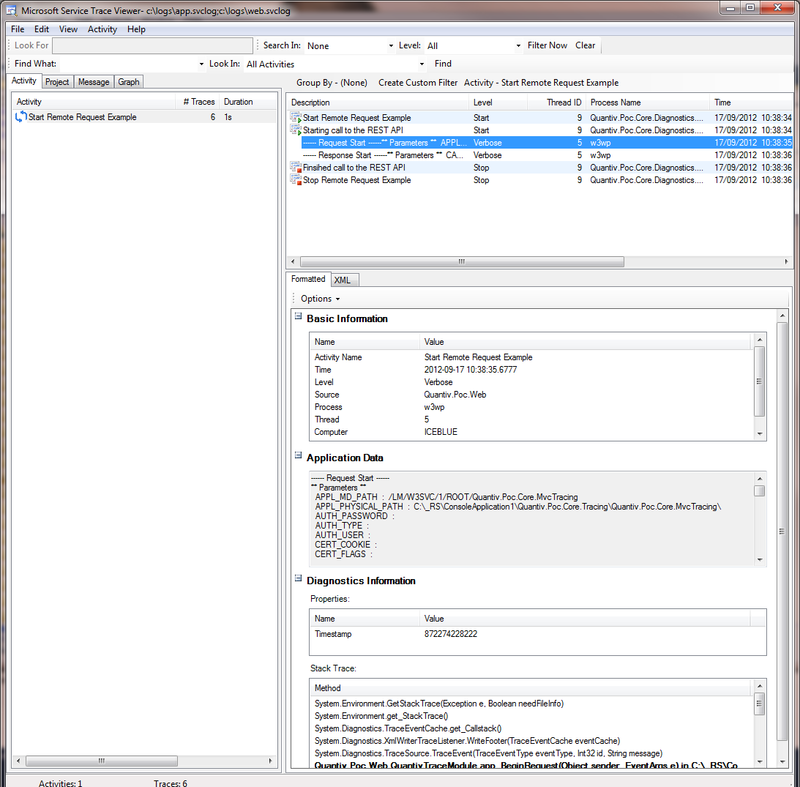 A single event could be recorded in multiple Listeners simultaneously; in the Event Log, a file and an email for example. This is unchanged. In the .NET 2.0 release .NET’s Trace framework was revamped to effectively provide most of the functionality you would ever need from a Tracing tool, taking into account the competitor functionality. SourceTypes, Trace Switches and Trace Filters were added as was the ability to track events across process and machine boundaries. However, there was no song and dance from Microsoft and it was an extension to the existing Trace and .NET framework so no new namespaces or assemblies. The changes went pretty much unnoticed and developers continued to use third party tools. There are no extra build, deployment or coding steps required to use Trace as the code is included in the .NET framework. In fact, most projects already reference the correct assembly so simply add a reference to System.Diagnostics and you are away. The Trace framework can work with third party logging frameworks that support listening for Trace events! So, if you still want to use the appenders or formatters supplied by log4net, for example, then you can, but your code doesn’t need to be littered with log4net references; it is almost impossible to remove a logging provider once it has been added to a codebase! It really is easy to use. There are a few, simple configuration steps but after that, the code is really easy. If you are using WCF, it integrates really nicely for propagation of calls through WCF process and machine boundaries. Finally, one of the most powerful features of the Trace framework is that it is built into the .NET codebase and passes context around behind the scenes. This means it really is possible to follow calls through an entire application, across processes and even across machine boundaries. What and When and to Trace? To make it simpler, the question should almost be reversed and be What and When Not to Trace! The more information you Trace the easier it is to understand what is going on in your code and diagnose and resolve any issues. That said, there is a performance hit with continually feeding information to the Trace Listeners but that is where Trace Switches and Filters prove invaluable. From a development point of view, being able to run your application and make sure variables are being set correctly, files are being loaded from the correct locations and each individual step in a workflow has been called are all crucial. Normally, developers do this through debugging but Tracing is equally valid and valuable especially for retrospective analysis. However, having the ability to ignore these Traces, or simply not generate them in a production environment is also essential to prevent performance problems or producing so many records that it is impossible to see any issues. From a production point of view, being able to quickly identify and diagnose exceptions or errors is also crucial. The Tracing framework should record every error that occurs, and ideally alert somebody to the issues. Similarly, some issues can be prevented by watching for thresholds being breeched or timeouts occurring. Line 18 is a critical error from which the application cannot continue. The Trace framework can be configured through Trace Switches so that the levels at which events are raised can have different outcomes. For example, it is possible to do nothing with Verbose events and just ignore them, write Warnings and Errors to the Event Log and send emails to support staff for Critical events. When the code is written, the developer should understand the different levels above and choose the most appropriate one as above. Then, configuration can be used to adjust the outcomes without changing the code. The following shows a simple configuration where all trace information is dumped to the Console through a single Trace Switch. Line 4 then shows a TraceSource being configured. We will talk about TraceSources in a moment but effectively this section says the any messages whose level is Verbose or above (effectively all levels) should be written to the following listeners – the console listener is then added. Line 11 shows where the listeners are configured. In this case, there is only one listener which is the console. The <trace autoflush=”true”/> ensures trace information is written immediately as opposed to when the application is closed. If we wanted to prevent the developer information from being recorded, we could simply change the switchValue to Information. This would mean only Information messages or above are sent to the Trace Listeners and recorded. In the example code above, no output would now be generated unless an exception was thrown. We can also add different listeners for different levels. The following example configuration shows that Information messages or above are displayed in the Console and Errors or above are added to the EventLog. Trace Filters have the same effect as Trace Switches in determining which Listeners record information. However, Trace Switches determine which listeners receive the event to be traced whereas Trace Filters are applied to the listener themselves and enable the listener to determine if it should Trace. This may seem very similar but it does make for simpler configuration. If we take the above configuration and change it around slightly to use filters we can end up with exactly the same results. In this configuration, all messages (the Verbose Trace Switch is being used) are sent to the console and eventlog listeners but the console listener only records Information events or above and the eventlog only records Error events or above. Trace Filters prove invaluable in some scenarios such as when numerous Trace Sources are configured. It becomes trivial to have one Trace Listener handle all errors produced by all Trace Sources. Do not use Write, use the TraceSource class! A Trace Source is really a way of being able to group code and to manage the Trace levels associated with it; the Trace Switches and Filters. In the examples above, we have been using a Trace Source called “DemoApp”. The code traces events against the “DemoApp” Trace Source and the configuration specifies a switchValue and one or more listeners. This means that all code that traces against the “DemoApp” TraceSource class instance will be subject to the same switchValue, filters and listeners. Hopefully, this posting has given you a good background in why the System.Diagnostics.Trace framework should be the only trace framework you need, given you some idea of how to get started, configure the output levels, switches and filters and use the Trace code.